If you’ve got 15 minutes, you’ve got time to do this quick-yet-intense full body workout. 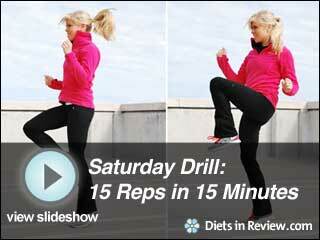 The easiest part about it besides it requiring no equipment is that each exercise is completed a total of 15 times. This means that once you learn the moves, you can get straight to it, counting 15 reps all the way. We integrate simple moves like high knees and jumping jacks with more challenging exercises like split squat jumps and push ups with a leg raise to get your heart rate pumping and add some serious tone to your figure. Get through the exercises as many time as you can in 15 minutes. Let’s get started!